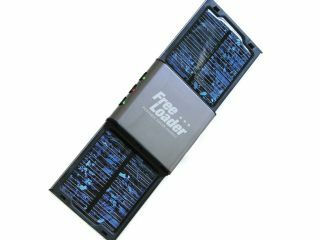 Solar Technology has today launched a new £30 gadget called the FreeLoader which uses solar power to charge gadgets such as iPods, digital cameras and mobile phones. Ideal for travelling, it can also be used as a green alternative to everyday charging - it doesn't need to be in direct sunlight and works indoors. According to market researcher Mintel , there are currently 10 billion chargers in use worldwide. Not only can they be a pain to manage, carry and store, but they often become redundant when users upgrade their devices, helping cause pollution. In addition, 15 billion batteries are thrown away annually. The FreeLoader can charge your phone or games handheld at the same time as its own internal battery - which holds its charge for up to three months - so you can use it to charge even at night time. It also works in cloudy weather, but you can pre-charge the device via a USB cable. The FreeLoader comes with adapters for all major phone manufacturers, as well as iPods and MP3 players.